RV forum is to answer any questions. 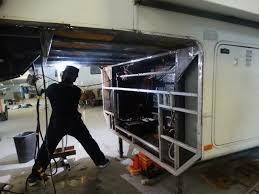 Diy or handy RV'ers to get Answers you can Email us or call us directly for any help!! Enjoy. Re: Pinbox Frame Flex (Again) in So. Ca. The frames are held together with self drilling/tapping screws. Mechanical engineering for shear, a harden set of pins or sleeves around bolts should be used for shear forces not screws or bolts. All fifth wheel manufactures appear to not do this. And if you look at the construct of them, they really cannot. I have seen bolts used for shear in Mil as well as NASSA programs as well as shear pins and harden shear sleeves. Without the shear pins or sleeves, the amount of fastener hardware is increased enable the fasteners to take the shear loads. We had unexpected failures in shear using bolts. An analysis under an electron microscope showed a contaminate in the fastener was the cause of the embrittlement and failure. The certifications were bogus. The metal came from a foundry in China and so did the certs. So how much confidence do you have on consumer hardware not having embrittlement problems? If one fastener fails, the load has to be added to the remaining fasteners. The another and another etc.. So I asked that larger and longer and more hardware be used. My shop doubled up on the fasteners as well. After I had mine repaired, I wanted to reduce the shock/shear forces on the fasteners. So I added the Trailair Flex Air king pin. It nice to see all the pounding from the fantastic roads, lol, not being transferred to the fasteners in the fifth wheel. Fix and keep, or new fifth wheel, I would not use a kingpin that doesn't remove the shear/shock off the fasteners. There is also a king pin hitch out there that has the airbags, four, in the base, but I really like the Flexair Trail Air kingpin. Thanks for the pictures offer and the technical discussion on the metalworking. I was thinking of running this problem past my aerospace engineer son, too. I thought the frame work was welded together like all of the other framework stuff. It seems to me my Sacramento RV repair guy said that he found broken welds. I was out on my exercise walk this morning and taking particular notice of the 5th wheel hitches. Has anybody noticed that the design of the Lippert and aftermarket hitches moves the pin about 18 inches forward of the frame pinbox structure?? This forward mounting magnifies the leverage stress on the pinbox mount during up and down bounces. I realize that this forward mounting of the pin is needed to get the truck bed to clear the front compartment of the trailer, but it sure doesn't help the stress on the pinbox metal. I saw some older 5th wheel hitches that just seemed to go straight down from the pinbox on my walk, too. I am going to take pictures of my rig this week, maybe some also of Heartland rigs in good condition in the park, along with measurements and a picture of the front cap to hitch string test. I will first talk to Heartland without wasting too much time, and maybe make a trip 100 miles over to Norco to explore possibilities with the repairer I may use there, and discuss things with my brother and his wife. I will keep this thread updated as things happen. Each frame it self is welded together, but the two frames are held together with self drilling/tapping screws. I ran into one rig, not a Heartland, that was bolted together by the owner. I mean large bolts! He found some white plastic bolt covers, but they really stuck out. He said that he wasn't going to have the failure happen again. Another new fifth wheel, SOB and three months old, had its frames come apart. The manufacture fixed it, but the owner asked me about how often this happens. They were new to fifth wheels. So this is an industry problem not a single manufacture problem. I thought maybe only us owners putting a lot of miles on our fifth wheels are having the problem, but the SOB had it happen during their first trip. Here is my most recent update. After moving the rig from Chula Vista to Menifee (about 70 freeway miles), I did my internet research, got a list of 10 potential repairers generated, took my laptop with the pictures of the problem, and planned a day of driving in So. Ca. to visit/interview them all. Temecula RV was helpful, but had a backlog until the end of June. They DID give me a loose ballpark estimate of $4K - 6K for the repair. I went over to Hemet Trailer Supply, and although they had 3 service bays, THERE WAS NO ONE PRESENT AT THE SERVICE DESK FOR OVER 10 MINUTES, AND NO EVIDENCE OF ANYONE WORKING IN THE SERVICE BAYS. There was even another customer waiting ahead of me. I walked out. Next stop was my preliminary favorite from their website, All Magic RV Repair in Norco. They were very sympathetic and attentive, and were ready to send a mobile estimator the 40 miles to Menifee where the trailer is set up. Their facility, though, is on a major active street, with a small front lot up a small hill. I had terrible images of trying to get my 57 foot rig just into their asphalt, and I don't think they had a forklift for moving the rig around. They didn't want to make ANY financial estimates immediately. I then went to Fontana to (Snells) RV Paint Department ( www.rvpaintdepartment.com ) I met with Raymond Lopez who runs the facility. I explained that I am a fulltimer, had enough room on my credit cards to pay only $5K, and wanted it fixed/upgraded correctly so that the problem DOESN'T RE-OCCUR. Raymond said that they would do the job for a MAXIMUM OF $5K, if their costs overran that they would eat the difference, if they took the front cap off and determined they couldn't do the job, they would replace the front cap and let me go with $0 charge. Once the front cap was off they would have the rig moved to an independent certified welder's shop (although they routinely do welding at their business). The welder will come up with the RIGHT fix (I am going to supply them with printouts of Marc's technical posts) and then the rig will be returned to RV Paint Department for final re-assembly. The only qualm I have with this proposal is that Raymond gave a time estimate of 1 to 2 months. My brother and his wife are comfortable with me staying with them for a month, but I do have other relatives in the area I could stay with. I am hoping that Raymond is way long on his time estimate, and the fact of small business cash flow will speed the job along. So, I got on the roof with a heat gun yesterday and removed the Eternabond tape over the top front cap seal (the tape backer came off easily, the underlying adhesive goo took a lot of heating and scraping). I then defrosted the freezer and am unpacking the fridge/freezer for transport to my brother's house. I have a big checklist of stuff to take to my brother's house for my stay starting today. I would like to look into moving from the MorRyde pinbox to one of the more Air Isolated ones as soon as I can build up my credit lines some. Thanks for everybody's advice and commiseration, and I will keep the forum updated on the repairs. I hope to get internal pictures of the damage/problems/fix. Last edited by wdk450; 06-10-2016 at 07:31 PM. I talked to someone else that had his frames welded and added gussets and then re-bolted. It cost about $1.5K more. They did not have to remove the front cap as well. I then went to Fontana to (Snells) RV Paint Department. I met with Raymond Lopez who runs the facility. I explained that I am a fulltimer, had enough room on my credit cards to pay only $5K, and wanted it fixed/upgraded correctly so that the problem DOESN'T RE-OCCUR. Raymond said that they would do the job for a MAXIMUM OF $5K, if their costs overran that they would eat the difference, if they took the front cap off and determined they couldn't do the job, they would replace the front cap and let me go with $0 charge. Once the front cap was off they would have the rig moved to an independent certified welder's shop (although they routinely do welding at their business). The welder will come up with the RIGHT fix (I am going to supply them with printouts of Marc's technical posts) and then the rig will be returned to RV Paint Department for final re-assembly. The only qualm I have with this proposal is that Raymond gave a time estimate of 1 to 2 months. My brother and his wife are comfortable with me staying with them for a month, but I do have other relatives in the area I could stay with. I am hoping that Raymond is way long on his time estimate, and the fact of small business cash flow will speed the job along. If any of us have to deal with this type of issue . . . we shouldn't have to pay one cent! No matter how old our RV is . . . this kind of issue should NEVER pop up! I hate it when Heartland or any other manufacturer hides behind their warranty when something just isn't right (been there, done that)! No Prowler Needed To Join! I am now staying at my brother's house in the downtown Riverside area while my repair is in progress in Fontana. Well, last night I walked to my truck parked next to a school across the street from his house, and found that my truck front passenger side window had been broken and some items in the truck stolen. The window repair is going to cost about $200, and the stupid things they took included my TPMS monitor (with a broken antenna) and my video display for my wired trailer rear camera system that is mirror shaped. Both items are most likely useless to anybody else. A replacement TPMS monitor is costing me over $150, but the replacement mirror monitor is only about $30. The idiots did NOT take the satellite radio receiver, my GPS or my checkbook. Go figure!!! A lot of car and truck windows broken and theft in this area as well. Only with cars and trucks with stuff visible. Never leave or have anything visible in you car or truck. I wish my truck could fit in my garage. Too tall and too long! Well the front cap is off, and there is nothing major wrong in the pinbox frame area. The re-enforcement triangular metal gussets evidently put in by Heartland/Lippert are impressive. There were 4 horizontal ones around the pinbox mounting plates, and 2 big vertical ones on the top of the 2 front vertical framing. I took a lot of pictures, but my cellphone camera malfunctioned. I believe the bulge in the bottom seam was caused by just a broken screw going into wood. I did take the opportunity to order a Trailire AirRide pinbox, which will be installed soon. The repair estimate has been dramatically reduced. The one thing that was noted was that the pinbox mounting bolts are thought to be cracking, and will be replaced. Does anyone have any recommendations on what strength these bolts/nuts should be?? Do the new pinboxes normally come with bolt/nut sets? Is there any other hardware like shear rings needed with the bolt/nut/ washer sets?